You've seen them on TV: huge, complex water features, with high-cost fountains, installed by skilled landscape designers. Rather daunting, aren't they? You want something cool and soothing for your own landscaping, but just a small water feature, you say? A cheap, low-maintenance garden fountain whose gurgling sound will soothe those frayed nerves when you pull into the driveway after a hard day at work? Well, that is exactly what these simple instructions show you how to build. Note: The fountain shown in the picture above is not the one described in the present tutorial, although it's similar in size. This photo shows an attachment that allows you to create a spray-style fountain -- which is another great idea for a small water feature. But the project I describe here uses statuary, instead. Small water garden pump. The one shown in my picture happens to be a "Little Giant" submersible pump, with a 6' cord. It's a 120 GPH pump, which means it displaces 120 gallons of water per hour -- sufficient for such a small garden pond. Small, cheap preformed plastic pond liner. These work well for the "pond in a pot" approach that we're taking here. For ponds too large for preformed liners, you have no choice but to purchase a flexible liner, instead, and form your own walls. Plastic outdoor fountain statuary and tubing. Sand. The sand will supply "adjustable flooring" for your preformed water pond liner. This will come in handy when you attempt to get your pond liner to sit level in its hole. If you stick with a small water feature for this project, you shouldn't have to sweat the choice of pumps that much. Water pump manufacturers recommend that the water in a small pond be turned between 1/2 time per hour and 1 time per hour. The maximum pond, therefore, that my 120 GPH Little Giant pump would be good for is a 240-gallon pond. The rigid pond liner that I selected doesn't come close to being that big. That's good news for my fountain because you want plenty of pump-power left over to supply you with a good, strong jet for a fountain. If you get carried away in your pond project and end up buying a bigger pond liner than I did, there are some simple formulas landscape designers use to determine water volume. To calculate cubic feet for rectangular ponds, multiply length in feet x width in feet x depth in feet. For circular ponds, multiply 3.14 (1/2 diameter in feet x 1/2 diameter in feet) x depth in feet. There are 7.5 gallons of water in a cubic foot. Multiply the total number of cubic feet x 7.5 to calculate the total number of gallons that your pond liner holds. Optional backyard pond supplies include rocks, plants, and additional statuary. The rocks would be an ornamental feature, to be placed in and around the artificial pond. This is a supply that's always in stock for me: I tend to pick up decorative rocks whenever I travel. Finally, you can make your small water feature a garden by incorporating plants. Other than floating aquatic plants like water lilies, your options usually are to plant around the edges of your outdoor artificial pond or else submerge some potted aquatic plants. 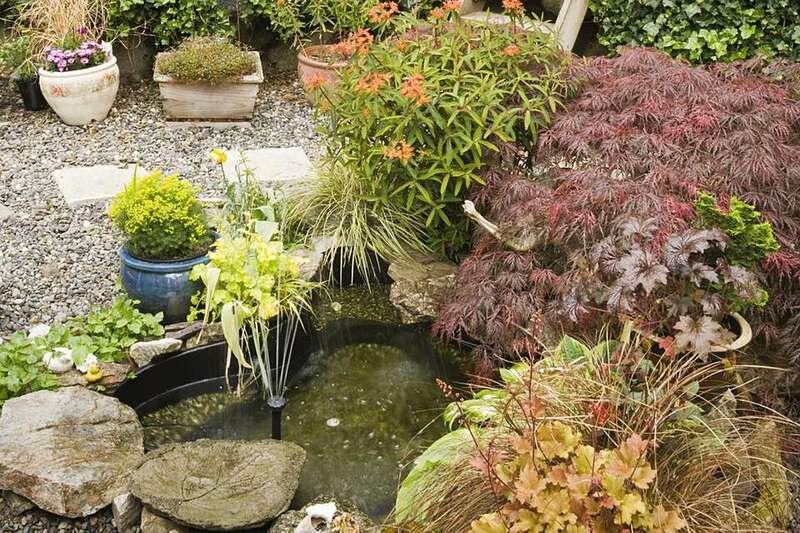 The latter option can make your water feature less low-maintenance, however, as the pond water will get dirty faster. Before excavating the hole for the pond liner of your outdoor water fountain, call the Call Before You Dig phone number, so as to avoid severing any underground lines. And there's a second call you may have to make: namely, to a certified electrician. Do you have a GFCI outlet near where the artificial pond will be? If not, call the electrician and have one installed. How near is "near?" Well, in my case, I was working with a pump with a 6-foot cord -- so the outlet had to be nearer than that. By the way, a great location for a water fountain is near a deck or patio, where you'll be within earshot of its gurgling sound as you kick back and unwind outdoors. Your first landscaping task is to remove any weeds from the area you've selected for your outdoor water fountain, and make sure it's level. Then you will dig out the hole, into which the preformed plastic pond liner will be placed. To get an accurate measurement for the hole's dimensions, simply flip the preformed pond liner upside down and trace around it. The pond liner that I used is just a small, cheap, rigid liner, 7" deep with a diameter of 2'. A water feature using a pond liner of this size will be just large enough to make a statement in your landscaping -- if you make it the focal point of a small niche on your landscape. Just use a "big fish in a small pond" approach (pardon the pun). That is, make sure your water fountain is situated in an area of your landscape where it won't be upstaged by larger elements. When you choose plants to grow around your water fountain, make sure their height at maturity is short, relative to the water fountain statuary. Draw the eye to the artificial pond by having a stone path lead up to it, by accenting it with a bright color, or by any one of a number of similar landscape design tricks. How deep should you make your hole? Well, what's the depth of your liner? Whatever that depth is, dig just a tad deeper. As far as the diameter of the hole is concerned, attempt an exact match with the diameter of the liner, but do not obsess over it. Should the hole end up too wide, you can just plug the gap with sand. Sand will also be used at the bottom of the hole since a sand floor will be malleable enough to allow you to play with the height of the pond liner. Put about an inch of sand in, so that the top rim of the preformed pond liner will stand about an inch above ground level -- reducing the amount of dirt that will keep falling into your artificial pond. You'll be pushing the sand around at the bottom of the hole to get the level of the pond liner just right. Next, place the preformed plastic pond liner into the hole. Check for levelness by placing a carpenter's level across it -- both front to back and left to right. Does the carpenter's level indicate that it's even? No worry. If it's uneven, pull out the pond liner and adjust the sand beneath. It's the decorative statues that really make an outdoor water fountain a focal point of your garden. But if our goal in this artificial pond project is building a cheap fountain, we'd better employ some do-it-yourself tricks to keep costs down. It's easy enough to go out and buy a costly water fountain statue with the "plumbing" all ready to go. But with a little ingenuity, we can reduce the cost of this artificial garden pond project considerably. We'll simply be making plumbing where no plumbing existed before! This also gives us more flexibility in our small artificial pond project. For in our shopping, we may stumble upon just the right statue -- and at a cheap price -- only to find that it wasn't designed to house water fountain plumbing. For my artificial pond, I had purchased discount plastic statuary -- a boy and girl holding a basin -- that was designed sans plumbing. So I simply drilled one hole in the bottom of the statue and another near the top. With an Exacto knife, I expanded the holes so that they'd be large enough for me to feed plastic tubing through. I used 1/2" plastic tubing because the discharge adapter on my pump is 1/2" (the discharge adapter is the little "pipe" coming up out of the pump's hole, through which the water is pushed out). With the plastic tubing fed through the statuary, the excitement begins! For now, it is time to bring your decorative water fountain statue over to the preformed pond liner. Fill the pond liner with water. Place the pump into the water, without plugging it in yet (keep the plug end over by its outlet, so that it will stay dry). The Little Giant submersible pump model that I mentioned should always be submerged when it's running -- otherwise, it will overheat and you'll damage the pump. Now take the end of the plastic tubing that's hanging out of the bottom of the statue and fit it over the pump's discharge adapter. Situate your water fountain statue wherever you planned for it to stand. In my pond's design, the statue sits on the rim of the pond liner (half over the water and half over the ground). And now for the moment you've been anticipating. Take the pump's plug, and plug it into the outdoor outlet. Enjoy gazing at that first jet of water, shooting up into the sky. After this initial enjoyment, you can go back to work, adjusting the way you've situated your water fountain statuary so that the jet goes where you want it to go. If the jet drops at the edge of the water, rather than in the middle, you'll lose water faster. Too much of the falling water will splash out onto the ground. The faster you lose water, the sooner you'll have to refill the pond. With these adjustments made, you're ready to incorporate decorations to enhance the beauty of your outdoor water fountain. Besides water garden plants and additional statues, decorative rocks placed in and around your new outdoor water fountain will dress it up considerably. If you've made a habit over the years of bringing home pretty rocks, this is the time to put them on display. Rocks and water complement each other. If a nice rock specimen looks pretty when it's dry, just get it wet -- and it becomes spectacular! When undertaking projects such as building artificial ponds, always keep home safety tips in mind.